Every now and then, a car comes along that embeds itself in automotive history, or defines a new market. You might be thinking of the Model T, the Mustang, or perhaps the original Mini. But sometimes, heroes come from the most unlikely backgrounds. 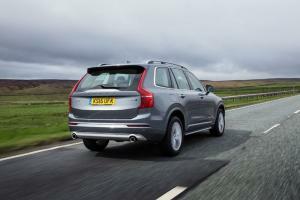 And I humbly propose that the Volvo XC90 has done more for road safety than almost any other car in recent history. Previous seven-seaters expected you to load your off-spring into what was effectively the rear crumple zone, but Volvo could see the glaring flaw in that arrangement. Launched in 2002, it offered an unassailable combination of space, comfort and safety that made it the darling of school runs everywhere, and its design was so right-first-time that it continued in production for over a decade. 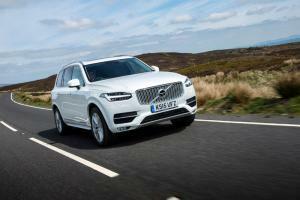 So, having successfully redefined an entire market, what challenge must the new XC90 meet? Simple. It’s going to redefine the company itself. 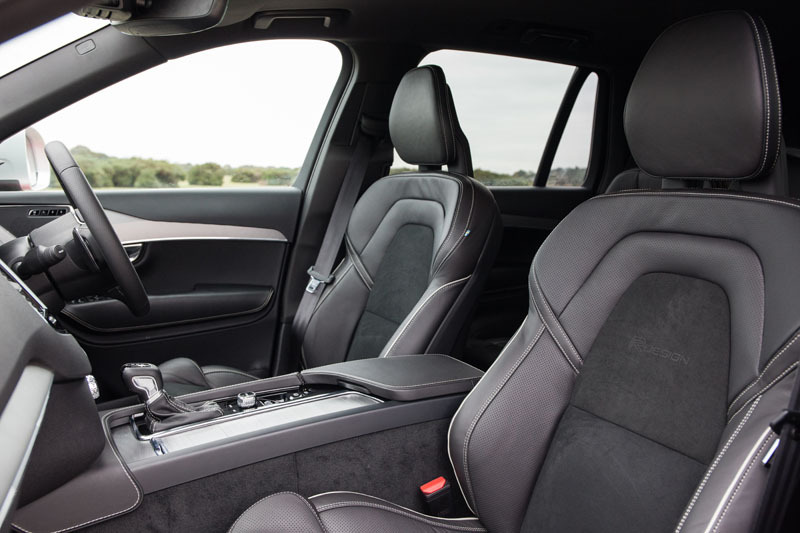 Having invented the seat belt and the rear-facing child seat, and then given them to the world patent-free, you’d be right to argue Volvo is hardly in need of redefinition. But having languished in under-investment purgatory under Ford ownership, it now finds itself being nurtured by new Chinese custodians Geely. 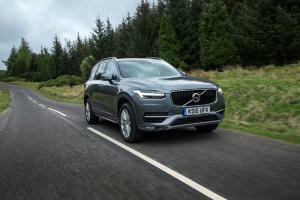 And under their arms-length stewardship, the company has delivered this, the new second-generation XC90. 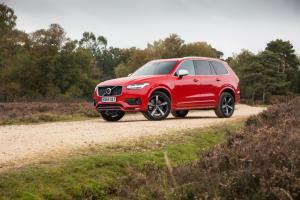 Calling the XC90 ‘new’ doesn’t quite cover it, though. 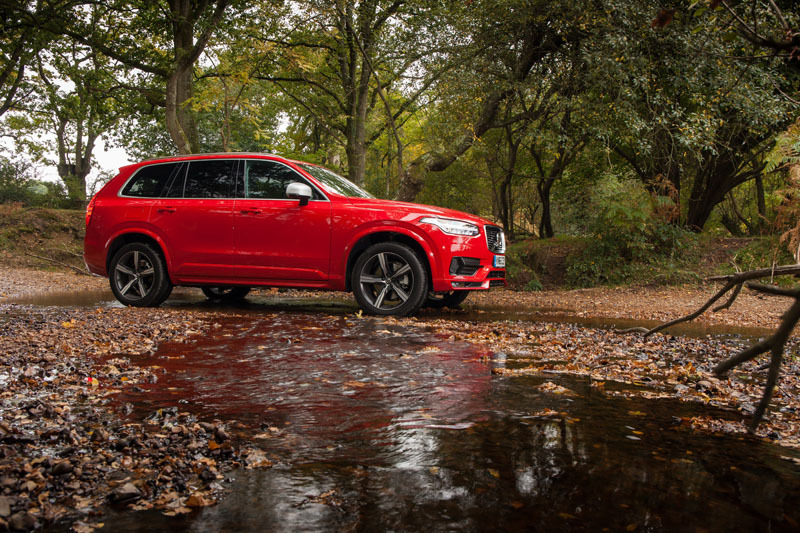 Not only does it demonstrate the company’s new design direction, but it’s also the first vehicle to use an entirely new platform, a raft of new technologies, and a range of new fuel-efficient engines – all of which have been developed in-house. 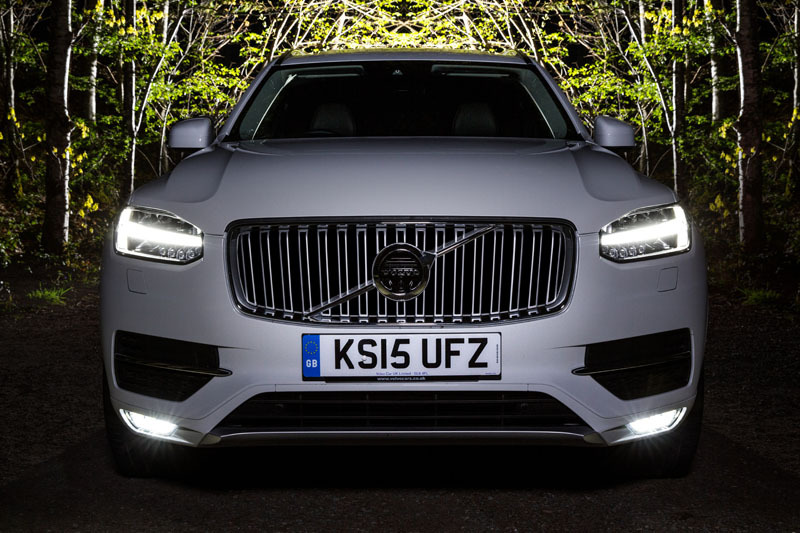 Setting the tone for the new design are the ‘Thor’s Hammer’ running lights, backed-up by LED headlights that automatically adjust their output to illuminate every inch of the road ahead without dazzling other drivers. From some angles, it’s perhaps a little boxy-looking, although opting for the non-body-coloured wheel-arch extensions helps to reduce some of the visual bulk of the side profile. 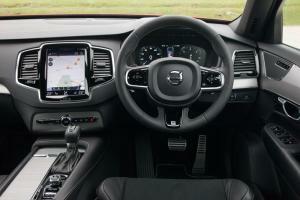 However, it’s the interior that is perhaps the best example of Volvo’s clean-sheet thinking. 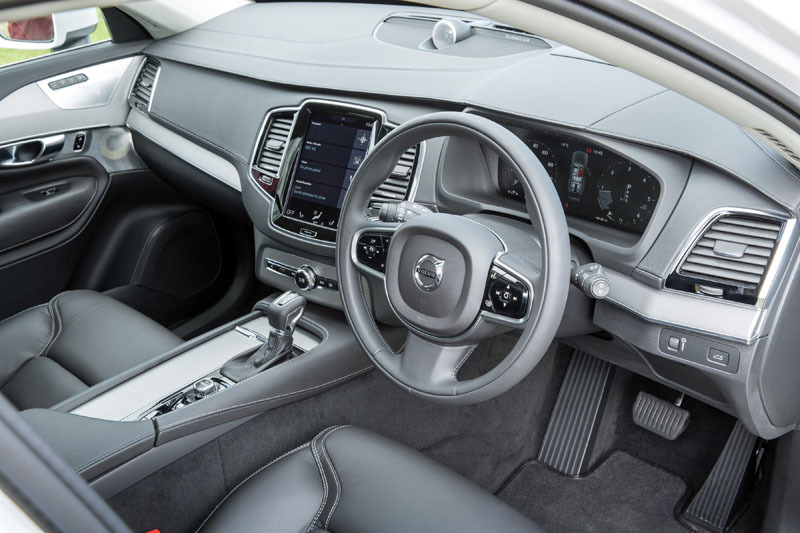 Of course, all the strong-points we expect from Volvo still remain, so that means a huge range of adjustment for drivers of all sizes and, frankly, some of the best seats in the business. What stands out is a much braver use of materials – real metal finishes come as standard, plus a choice of tasteful carbon, wood and even crystal as options – with some elements proudly shown off at night through copious use of ambient lighting. For all the technology packed into the XC90, Volvo were keen to reign in the number of buttons on display, and their efforts have certainly led to a surprisingly clean and simple dashboard. 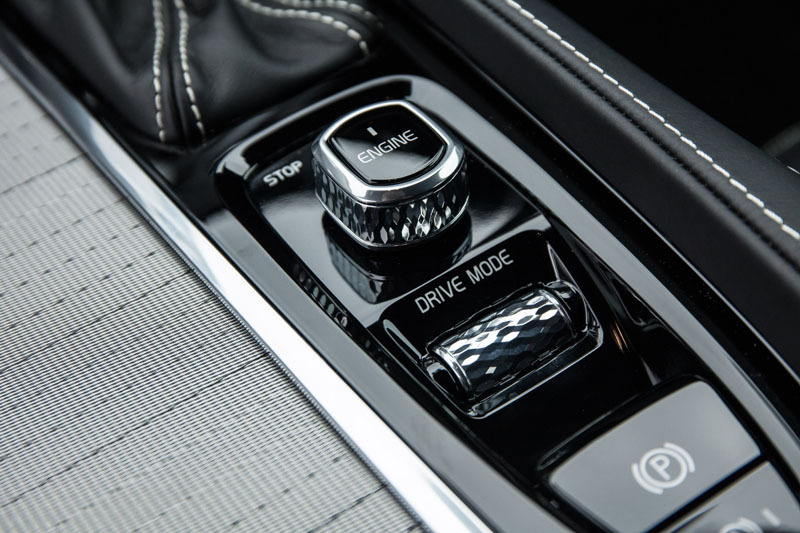 In fact, physical buttons are limited to just a handful in front of the gear-lever, with the majority of the car’s functions now controlled via a new tablet-style interface that’s not only appealing to look at, but also intuitive in its layout and ease of navigation. 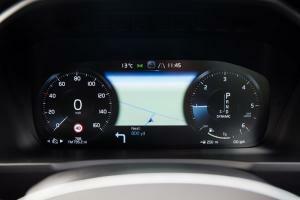 Connected features are aplenty, ranging from the (optional) Android Auto and Apple CarPlay, to the constantly updated traffic information and the ability to book a service from the car itself. There’s even a Windows 10 app to keep an eye on the car’s vital functions. Unlike some of its rivals (Discovery Sport, we’re looking at you), everything worked flawlessly during our testing, and special mention must go to the standard hi-fi system for its awesome sound quality, while the optional Bowers & Wilkins system is simply out of this world. Continuing the all-digital theme, the instrument cluster offers a choice of different styles, including the option of a navigation display between the dials, even if you’re not currently using the route guidance. Rear seat passengers benefit from good headroom, well contoured seats, and only minimal intrusion from the transmission tunnel. 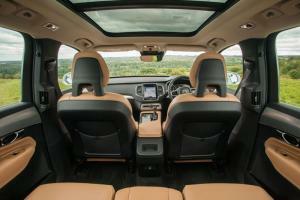 The seats recline for comfort on longer journeys, or slide forward to offer more legroom for those in the third row. Volvo suggests 5ft 7in is the comfortable limit for rear-most passengers, but with easy access, their own cup-holders, armrests, and storage cubbies, even adults will find it a usable space. All models feature a remote-opening electric tailgate that reveals 451 litres of cargo space, increasing to 1,102 litres with the rear-most seats folded. 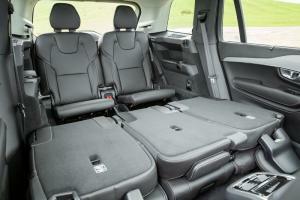 With the second-row seats stowed, that opens up to an incredible 1,951 litres that rivals most vans. Practical touches are in abundance, such as the shopping bag hooks, charging points, and the second button on the tailgate that closes it and locks the car, allowing you to walk away nonchalantly without a second glance. In fact, the only negative point is that there isn’t anywhere convenient to store the cargo cover when not in use. 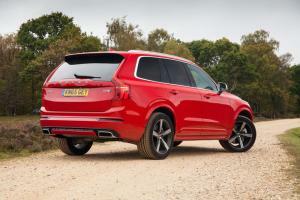 Engine choices are between a 2.0-litre twin-turbo diesel dubbed the D5, and a 2.0-litre super- and turbo-charged petrol unit, badged the T6. The D5 is impressively quick, its 235hp and 480Nm of torque enough for a 7.8-second sprint from 0 to 62mph, yet it emits just 149 g/km of CO2 and returns up to 49.6 mpg. The T6, meanwhile, is a bit of a rocket-ship, its 320hp propelling the XC90 to 62mph in just 6.5 seconds. Quicker than that, though, is the T8 Twin Engine, which mates that same petrol engine to an 82hp electric motor to give a total output of around 400hp. Its party trick is that it achieves up to 112.9 mpg on the official tests with emissions of just 59 g/km, and can travel for up to 25 miles on electric power alone. Whichever engine you choose, it’s mated to an eight-speed automatic that blends each ratio smoothly into the next, yet responds keenly when it needs to. 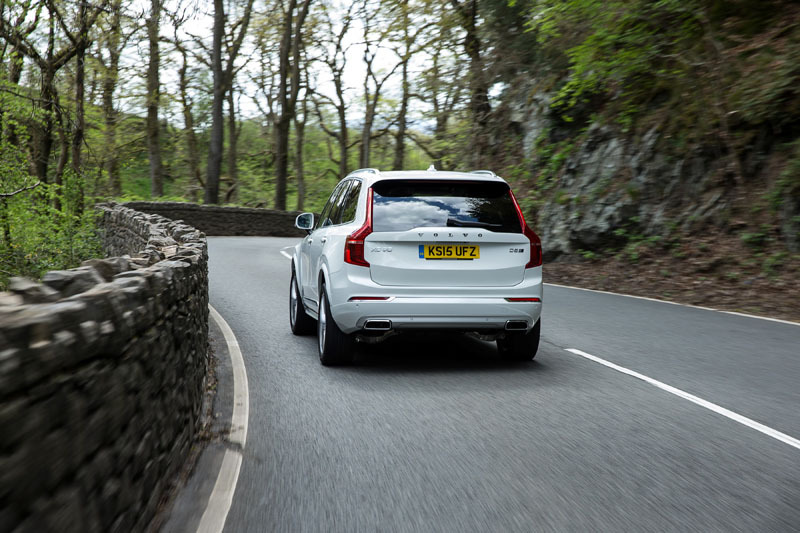 We spent a weekend trudging up and down the UK’s motorway network, and we quickly grew to appreciate the Volvo’s sense of serenity and sheer isolation from the outside world. Helping you tackle the miles is the adaptive cruise control that maintains a set distance from the vehicle in front, braking to a stop if necessary, plus a Pilot Assist mode that follows the car ahead in stop/start traffic, even steering for you automatically. The brakes are excellent and with real bite, too, despite needing only very small pedal inputs, yet they’re still incredibly easy to modulate. The ride can feel a touch stiff at low speeds, although it’s better on models with the optional air suspension, but the benefit is that it’s actually quite pointy, responding well to changes of direction and resisting body-roll far better than you’d think possible. Impressive as all of this is, two key characteristics have us sold on the XC90: firstly, the sheer efficiency of the thing is astonishing. There aren’t many cars that will tell you they’re calmly tootling along the motorway at 50 mpg or more, all while allowing you to have a whispered conversation with your passengers. 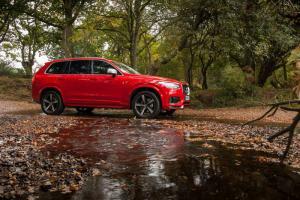 The fact that this is big seven-seat SUV completely validates Volvo’s decision to create a range of hyper-efficient four-cylinder engines. 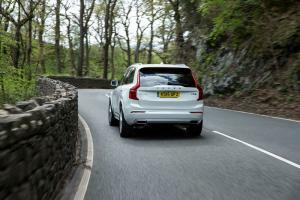 But what impressed us most was Volvo’s use of technology, all of which quietly gets out of your way and just gets on with its job. The XC90 is a tool for transporting you and your family in perfect safety, and the company’s vision is that no-one will be killed or seriously injured in a Volvo by 2020. 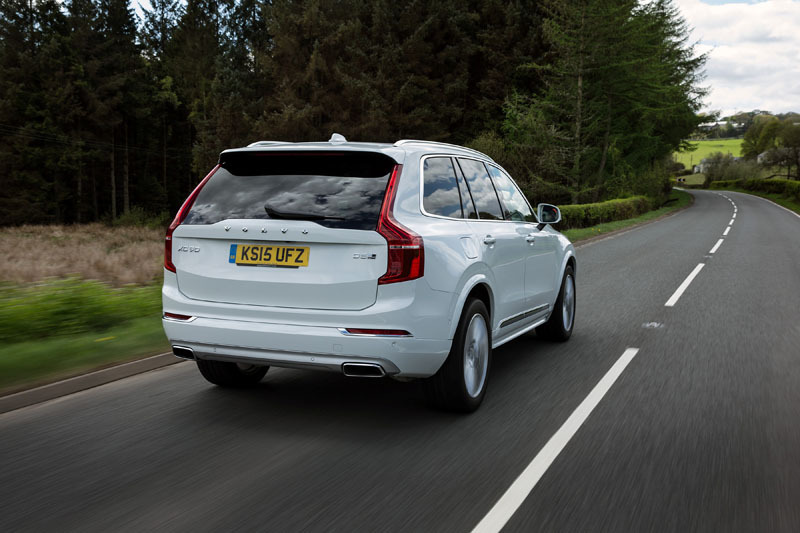 The technologies the company uses to achieve that are incredibly complex, but the XC90 doesn’t require you to know what they are, or even that they exist at all. 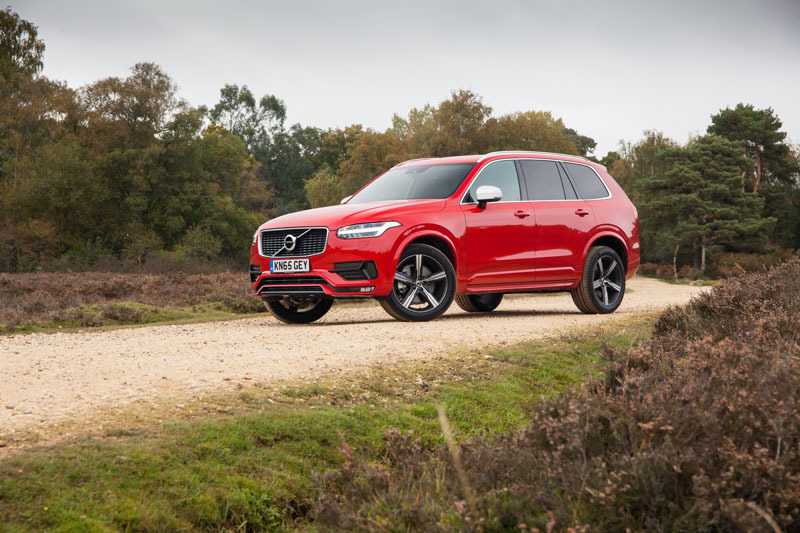 If the XC90 offers a taste of what we can expect from now on, I can’t help feeling that we’re about to embark on something of a golden age for Volvo. Third row seats technically for children, but still offer armrests, cup-holders, charge ports, etc. Combined close/lock button on tailgate – why does no-one else do this?